The productivity of any garden depends on how well you prepare your planting ground. Tilling is the most vital process in garden preparation for planting. Many new gardeners are usually confused whether to till or not. If they choose to till, they do not know the proper way to do it. Tilling is necessary if you are dealing with compacted soil or virgin ground. You can also till to amend your existing garden in the fall. So, do you want to know how to till your garden properly? I guess your answer is yes. In this informative resource, you will learn a few secrets. You can use the secrets to achieve the best tillage. A great tillage will definitely result is better produce. You can trust the information get here. They are thoughts and practices of seasoned gardeners. A freshly tilled ground offers loose soil for young plants. It does not matter whether you plan to cultivate vegetable or flowers. Follow the following simple tips. I guarantee you will not go wrong. The first thing you must do is conduct a soil test. It is especially important if you have never done it before. Results of such tests will show to you if your soil needs any amendments. Keep in mind that you must make any necessary amendments before you till. The main aim of tilling is to turn the soil to ensure it mixes well with nutrients. Home soil testing kits are available for that purpose. The common amendments include mulch, lime, organic fertilizer and peat moss. These amendments are inexpensive. Yet they will correct the nutrient imbalance revealed by the soil test. Spread the necessary amendments on top of the ground to be tilled before you can work on it. This way, the amendments will mix well with the soil to enrich it. Resist any temptation to apply commercial fertilizer. This is especially true if you are tilling your garden for the first time. This tip applies to virgin grounds. Once you determine where your garden will be, go ahead and prepare it for tilling. Tilling unprepared land can be difficult. Besides, any residual obstacles on the ground can damage your tiller or cultivator. You have to be sure to remove any shrubs and large weeds. Deal with sod (turf of grass and part of soil beneath it held together by grassroots) before tilling. A good way to manage sod is to incorporate it into the soil in the fall. It will provide nitrogen to the soil. Do not make an attempt to work sod into the soil during spring. The reason is that the grass in the sod might resurface as soil temperature rises. Early spring is the best time to till a virgin ground. It is the best time because the soil is dry. It is also easier to achieve fine and smooth planting ground at the time. You should wait until the soil is ready. But how do you know that the soil is ready for tilling? Well, you can use a simple test. Take a small sample of the soil in your hands and squeeze. If the soil crumbles, it is ready for tilling. If it forms a paste, wait a little longer. It is important to get their tilling time right. If you till your garden when it is too moist, it will form a clump. As soil temperature rises, the clumps with dry into an unmanageable chunk. What's more, soil that is too dry is difficult to work on and will not break up easily. The simple test described can help you know the appropriate soil consistency. There may tools that can help you with tilling. However, many experienced gardeners choose to work with a tiller. The machine works by turning the soil and mixing amendments fast to establish a fertile soil. Tillers can range from small mini-tillers to huge machines with power to tines and wheels. The choice of the tool to use depends on the size of your garden. Some rear tine tillers are versatile. You can use them in any garden. They will make your work easier and more efficient. The benefits of using a rear tine tiller are far-reaching. Some tine tillers feature depth regulators. This means you can till to the right depth depending on the type of plants you will grow. The most important thing is that you match the tiller to the purpose and size of your garden. Use a tiller to go over your garden in an up and down fashion. When done, go over the entire area. Remove any plant roots and other underground vegetation. Tilling may bring them to the surface. Pick the roots or vegetation and heap them up outside the garden. Once you are sure all the unwanted chuffs are out, till again. This time, work from side to side. This will break the soil clumps well and ready your garden for planting. Your aim should be to loosen the garden soil down to about 6-8 inches. This will give plant roots enough room in the soil to spread their roots. You need to be careful enough not to bring the subsoil by tilling too deep. The subsoil is deficient and will interfere with the growth of your plants. I would recommend that you finish your tilling by raking the surface of the garden smooth and flat. Raking will break the final clumps and leave the garden ready for the new crops. 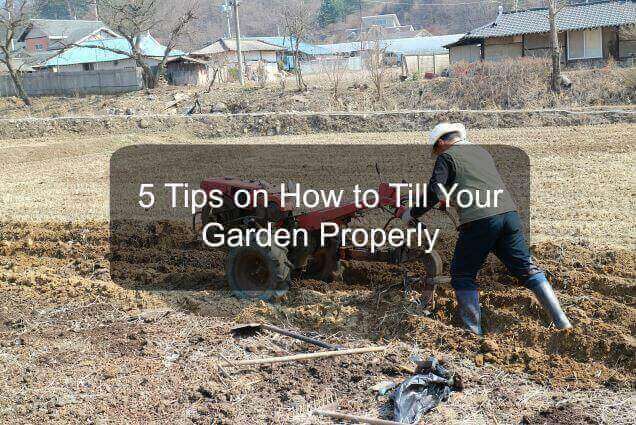 It is not hard to know how to till your garden properly. If you follow the above tips, your work will be easy and effective. The productivity of your garden will inevitably increase. These are the tips used by seasoned gardeners. You cannot help but admire their gardens. You have to remember that good gardening starts with soil preparation. The first aspect of soil preparation is tilling. Do it rightly, and you will enjoy excellent results.